Learning spaces must become learner-centered. All you have to do is look around and see the amazing changes that are taking place in workspaces around the world. Many people have become enamored with what places such as Google and Pixar have done to improve working conditions for their employees—and these companies have exhibited great success while their workplaces are very unconventional. These types of workplaces have embraced the mantra that a creative work environment motivates and inspires innovation. These types of changes are both exciting and innovative. To get better results, they intentionallyincorporated elements that foster creativity, collaboration, flexibility, and communication. This is more than a great concept that has become a reality in the workplace; we believe it should be common sense as well. Who wants to go to a job all day and sit in a hard chair at a desk in a creatively stifling cubicle, while being rained on by effervescing light? No one. That’s certainly not our idea of an ideal workspace, and we would wager that most school leaders feel the same way. As expectations related to producing better outcomes change, businesses have capitalized on a design trend that has led to improved results. But what about schools? What about the work we do? If we know that we as leaders wouldn’t want to work in these types of spaces, then how can we possibly ask our kids to do so? Leaders who intentionally design schools understand that design empowers learning. For learning to be transformed, our traditional spaces must be as well. Supporting this notion, a research study out of the University of Salford Manchester (UK), followed 3,766 students in 153 elementary classrooms from 27 different schools over a three-year period, analyzing classroom design elements along the way. The report indicates clear evidence that “well-designed primary schools boost children’s academic performance in reading, writing, and math” (Barrett, Zhang, Davies, & Barrett, 2015, p. 3). The study found a 16 percent variation in learning progress due to the physical characteristics of the classroom. Additionally, the study indicated that whole-school factors (e.g., size, play facilities, hallways) do not nearly have the level of impact as the individual classroom. 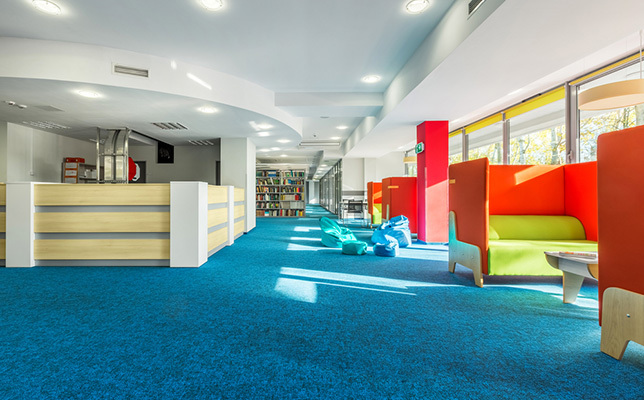 The effect of learning spaces on various behaviors—territoriality, crowding, situational and personal space—has been the focus of some sociological and environment behavioral research. The consensus of this research is that the space itself has physical, social, and psychological effects. One study measured the impact of classroom design on 12 active learning practices, including collaboration, focus, opportunity to engage, physical movement, and stimulation (Scott-Webber, Strickland, & Kapitula, 2014). The research indicated that intentionally designing spaces provides for more effective teaching and learning. In this particular study, all of the major findings supported a highly positive and statistically significant effect of active learning classrooms on student engagement. There’s little disagreement over the fact that physical activity is linked to higher academic performance and improved behavior. From the oxygen that flows to the brain to the physical health of students, an environment that promotes movement and interactivity promotes student learning. It’s also understood that even short bouts of physical activity in a classroom can improve students’ on-task behavior, thereby boosting engagement. In a research study on the link between standing desks and academic engagement, researchers observed nearly 300 children in second through fourth grade over the course of a school year (Dornhecker, Blake, Benden, Zhao, & Wendel, 2015). The study found that students who used standing desks, more formally known as stand-biased desks, exhibited higher rates of engage- ment in the classroom than did their counterparts seated in traditional desks. Standing desks are raised desks that have stools nearby, enabling students to choose whether to sit or stand during class. The initial studies showed 12 percent greater on-task engagement in classrooms with standing desks, which equated to an extra seven minutes per hour, on average, of engaged instruction time. Engagement in this study was measured by on-task behaviors such as answering a question, raising a hand, or participating in active discussion. Overall, the results indicated that standing desks help combat childhood obesity and increase energy expenditure without negatively affecting academic engagement. As a follow-up to this study, one of the lead researchers, Mark Benden, shared the following conclusion: “Standing workstations reduce disruptive behavior problems and increase students’ attention or academic behavioral engagement by providing students with a different method for completing academic tasks (like standing) that breaks up the monotony of seated work.” Benden went on to say that “Considerable research indicates that academic behavioral engagement is the most important contributor to student achievement. Simply put, we think better on our feet than in our seat” (Davis, 2015). In a similar light, many researchers believe that active, standing experi- ences in elementary school should be the norm rather than the exception. One team spent two years studying 193 students across three elementary schools in Texas (Wilson, 2016). Some students were observed in classes that had traditional desks, whereas some were in classes that had standing desks. Other students had one year of traditional desks and one year of standing desks. After adjusting for grade, race/ethnicity, and gender, the study found that students who used the standing desks had a 5.24 percent decrease in Body Mass Index (BMI) percentile compared to the kids who sat. The only altered variable in the study was the desk itself, showing the impact of the space on something as personal as physical health. There’s little disagreement that creating flexible spaces for physical activity positively supports student learning outcomes. However, it’s import- ant to note that it’s not simply the physical layout of the room that affects achievement. Research also indicates that teachers, particularly those in the early elementary grades where young children have an immature ability to regulate focused attention, must also consider visual stimuli. One par- ticular study investigated whether classroom displays that were irrelevant to ongoing instruction could affect students’ ability to maintain focused attention during instruction and learn the lesson content. Researchers placed kindergarten children in a controlled classroom space for six intro- ductory science lessons, and then they experimentally manipulated the visual environment in the room. The findings indicated that the students were more distracted when the walls were highly decorated and, in turn, spent more time off task. In these environments, students demonstrated smaller learning gains than in cases where the decorations were removed (Fisher, Godwin, & Seltman, 2014). In addition to the physical and visual makeup of the learning space, a building’s structural facilities profoundly influence learning. Extraneous noise, inadequate lighting, low air quality, and deficient heating in the learning space are significantly related to lower levels of student achieve- ment (Cheryan, Ziegler, Plaut, & Meltzoff, 2014). According to data from the National Center for Education Statistics, more than half of U.S. public schools in 2012–2013 reported the need to upgrade structural facilities including plumbing, air quality, and temperature regulation. Additionally, according to statistics, students of color and lower-income students are more likely to attend schools with inadequate structural facilities, yielding another level of educational inequity (Alexander & Lewis, 2014). The tradition of learning space planning that utilizes a seats-per-square- foot mindset may be an efficient process for traditional calculations, yet it is ultimately a disservice to the academic desires of 21st century teaching and learning. Evaluating learning spaces based solely on the assumption that all seat time is created equal is counterintuitive to what we know about high-quality teaching and learning. Redesigning traditional learning spaces isn’t simply a notion that should take place as school districts build new buildings and renovate outdated ones. Understanding how the learning space itself can affect the way students learn is key. Part of the issue facing school leaders today is that quite often the decision about learning space design is made by those without recent (or any) experience teaching or by those with little knowledge of classroom design. If learning is going to be transformed, then the spaces in which that learning takes place must also be transformed. While driving the backroads of Pennsylvania one summer, I (Tom) came across a carefully laid-out cemetery. It grabbed my attention, so I pulled over for a closer look. As I perused the scenery, I noticed that all of the tombstones were equidistant from one another. The rows were impeccably aligned; each faced the same direction. Outlined by a stone wall, the plot of land was a perfect rectangle. With the exception of some updated land- scaping, the space remained seemingly untouched for a number of decades. My heart sank when I thought about how this space—a cemetery— resembled the classroom space I designed for my very first class of 4th graders. The learning space I created early on as a teacher would have looked almost identical to this cemetery if drawn as a map. Add an oversized wooden desk in the corner and an interactive whiteboard and U.S. flag on the front wall and you have not only the first classroom environment I created but also an environment that resembles many of today’s learning spaces. These classrooms are suffering from what we’ll coin the “Cemetery Effect.” Side-by-side images of classrooms from the early 1900s and ones from today yield eerie similarities, even after more than 100 years of research and innovation. During the industrial era, when students were essentially trained to work in factories, “career readiness” meant preparing for jobs in which a worker would spend hours a day performing the same routine task, often even spending his or her entire career at the same company. In the one-size-fits-all, sit-and-get instructional model, an ability to regurgi- tate information was the key to success and a sufficient paradigm for that world of work. The need to redesign our students’ learning environments is not sim- ply an idea from the latest Pinterest board; it’s one of necessity. There are certainly times when students should work independently and quietly in their own spaces. However, for far too long, that’s been the main model of instruction in many classrooms. Schools and classrooms must transform from an industrial era model to one that is learner-centered, is personalized, and leverages the power of technology.